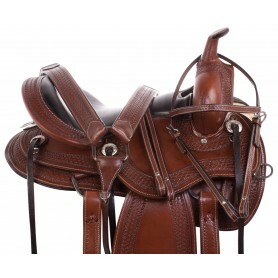 We are sure to have a saddle to meet your needs at a price to match your budget. With our complete range of gorgeous, hand-tooled, Western saddles ready to ship to you within 48 hours from Illinois, you are guaranteed to receive top-notch quality for your riding pleasure. 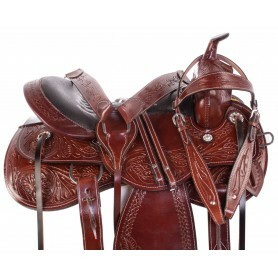 An expertly-designed, high quality leather, suede or synthetic saddle with hand-tooled craftsmanship can make a huge impact on your pleasure riding, show ring performance, ranch work and trail adventures. Saddleonline.com crosses borders to bring you the very best in Western, English and Australian saddlery at affordable prices. Extra-strong fiberglass trees with wood reinforcements underneath these attractive saddles allow you to feel safe and secure on even the most mountainous terrain. 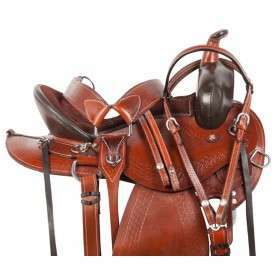 Pony saddles, barrel saddles, reining saddles, Arabian, endurance and ranch saddles are all found right here at SaddleOnline.com, along with tack accessories and riding gear.